Many industries are facing major disruptions to their business models, as global economic pressures, new routes to market, pervasive connectivity, global market access, lower barriers to entry, and new expectations from tech-savvy consumers are creating a new imperative to drive greater innovation. However, while demand for creative and disruptive technology services has never been higher, the IT department’s ability to respond with speed and agility is hampered by flat budgets, decreasing resource capacity, and concerns about security and compliance. 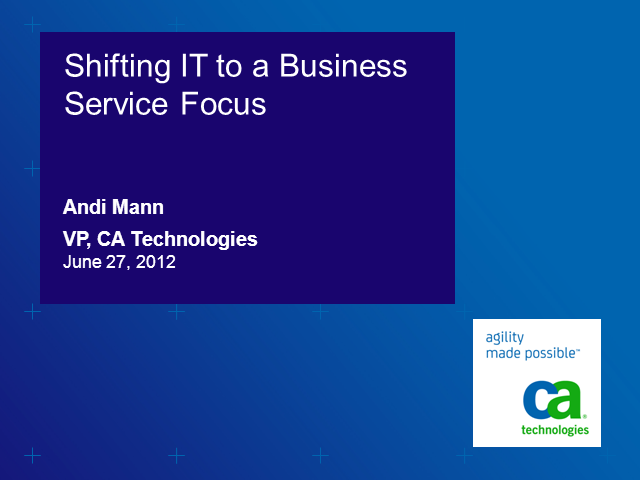 Join CA Technologies on June 27, to learn how to actively respond to this new “Innovation Imperative” and shift your IT strategy to a Business Service focus to help ultimately grow your business.